FILE – SPLA-IO (SPLA-In Opposition) rebels carry an injured rebel after an assault on government SPLA (Sudan People’s Liberation Army) soldiers, on the road between Kaya and Yondu, South Sudan, Aug. 26, 2017. 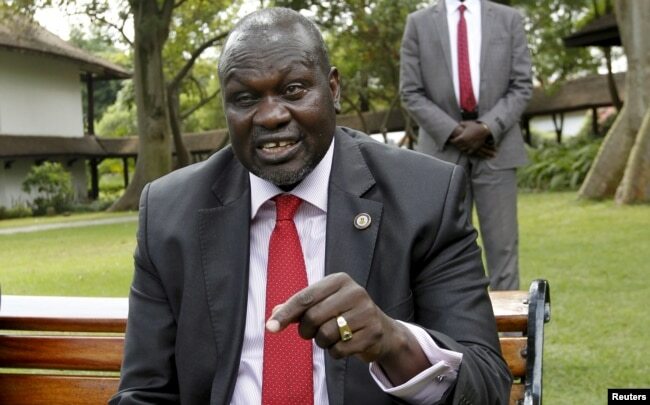 KAMPALA, UGANDA (VOA) — The U.S. government is calling on East African leaders to release five unpublished reports documenting violations of South Sudan’s failed December cease-fire and to punish those responsible for the violations, a senior White House official told VOA. 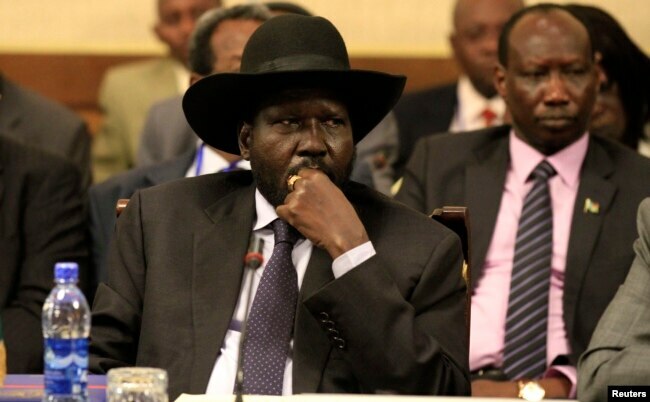 The Intergovernmental Authority on Development (IGAD) has overseen four years of unsuccessful peace efforts in South Sudan and warned it will use sanctions to hold to account commanders driving the country’s brutal civil war. But IGAD has yet to follow through on threats of sanctions, or make details of most violations public. The East Africa regional bloc mandated an international military monitoring mission, known by its acronym CTSAMM, to investigate alleged cease-fire violations. “We would like to see IGAD support CTSAMM to function as intended, which would include its release of all reports on cease-fire violations as soon as possible,” said the Trump administration official, who spoke on the condition of anonymity because the official was not authorized to speak. Ethiopian Foreign Minister Workneh Gebeyehu, who chairs IGAD’s Council of Ministers, declined to comment on why the bloc had not released the monitors’ reports. In a March 26 communique, the council said it forwarded one of them to the African Union for action. The senior U.S. official added Washington was “concerned” by reports of continued fighting in South Sudan, including military campaigns by the government around Nassir town in the country’s northeast, and around Kajo Keji and Yei in the country’s south. The United Nations has also blamed rebels for attacking aid workers near Yei this week. FILE – South Sudan’s President Salva Kiir attends a session during the 25th Extraordinary Summit of the Intergovernmental Authority on Development on South Sudan in Ethiopia’s capital, Addis Ababa, March 13, 2014.
analysts say rivalry among IGAD member states Ethiopia, Sudan, Uganda and Kenya, in particular, is undermining the bloc’s effectiveness on the conflict. South Sudanese civil society leader Peter Biar Ajack accused IGAD of talking tough but being “reluctant” to act. Washington has spent more than $25 million on the CTSAMM monitoring team’s operations to date, the White House official said. The five unreleased reports include an investigation into a February 12 attack by government forces near Nassir, said monitoring team spokeswoman Ruth Feeney. The team submitted the Nassir report to IGAD’s Council of Ministers on February 22, Feeney said. The other four were sent to IGAD on March 23. On Thursday, the monitors accused unnamed forces in South Sudan of carrying out additional unauthorized troop movements. Feeney said the monitoring team did not have a mandate to release its own reports. She said the team also submitted the five reports to its parent organization, the Joint Monitoring and Evaluation Commission (JMEC), which politically monitors implementation of South Sudan’s cease-fire agreements. JMEC spokesman Richard Bailey declined to explain why his organization had not released the reports. FILE – South Sudan’s rebel leader Riek Machar speaks during an interview in Nairobi, Kenya, July 8, 2015. South Sudan’s war began in December 2013 between troops loyal to President Salva Kiir, an ethnic Dinka, and rebels under former Vice President Riek Machar, a Nuer. The war has killed tens of thousands of people, drawing in most of the country’s ethnic groups and spawning numerous new rebel militia. In the last year, the United States has ramped up pressure on Kiir’s government, which is widely seen as the main driver of the conflict, by imposing an arms embargo and sanctioning numerous current and former officials, as well as blacklisting companies linked to the country’s oil industry.